Iran fans watched their team beat South Korea 1-0 in a World Cup qualifier on Tuesday, despite the constraints imposed by a holy day. The match at Tehran's 100,000-seater Azadi Stadium was held on the first of two mourning days on the Shia Islam calendar. Fans had been asked to replace football chants with religious slogans and wear black. 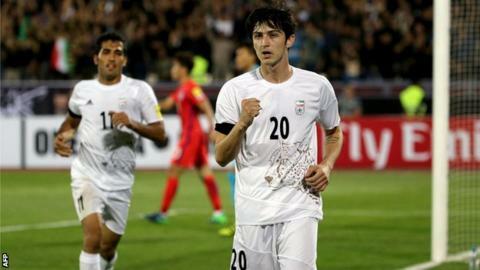 Sardar Azmoun's 25th-minute goal put Iran top of their qualifying group. Fans were asked to raise clenched fists and chant "Ya Hussein" during the match, while at half-time singers performed solemn religious songs on the pitch. Tuesday is Tasu'a, when Shia Muslims mourn the start of the battle of Karbala, when Imam Hussein - an important figure in the religion - was martyred. Seventy two of his followers and members of his family also perished in today's southern Iraq. On the the two days of mourning, men in Iran gather in long processions and beat their chests to the rhythm of a drum. Some may even flagellate their backs with chains as crowds come out on the streets to watch them. Clergymen sit on raised platforms in mosques recalling the historical event that is eulogised as the martyrdom of Imam Hussein.